Rinnai is the largest gas appliance manufacturer in Japan and is the No. 1 selling brand of gas tankless water heaters in North America. Rinnai America Corporation, a subsidiary of Rinnai Corporation in Nagoya, Japan, was established in 1974 and is headquartered in Peachtree City, Ga. Rinnai Corporation manufactures gas appliances including tankless water heaters, a wide range of kitchen appliances and heating and air conditioning units. Rinnai’s database is an easy-to-use solution that enables consumers and installers to calculate rebates, incentives and on-going cost savings based on a homeowner’s ZIP code. 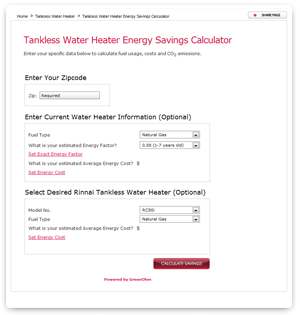 To identify the incentives they are eligible to receive, consumers just need to input their ZIP code and choice of Rinnai tankless water heater or ultra-efficient boiler into the database search windows. The system then displays the various savings opportunities available in a consumer’s geographic area. By holding their computer mouse cursor over the red rebate box on the results screen, consumers can quickly view rebate and tax credit highlights in a pop-up window, or they can click on the gray Rebate Details button below their desired appliance model to view detailed information, including eligibility requirements, incentive amount and redemption instructions. "We're excited to offer these new resources to help homeowners visualize their potential cost and energy savings in a quantifiable way. 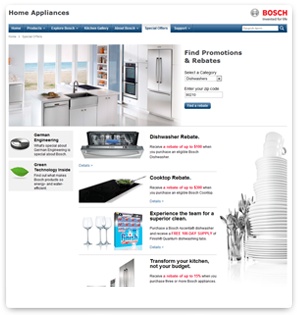 We designed these tools to help consumers make informed decisions about investments in home appliances. We also anticipate that installers will find them helpful when fielding questions from cost-conscious consumers." Bosch Home Appliances is part of BSH, Bosch and Siemens Home Appliance Group, the third largest appliance manufacturer in the world. Known worldwide for raising standards in appliance efficiency and quietness, Bosch is the only US appliance manufacturer with entire product lines of ENERGY STAR qualified dishwashers, washers and refrigeration. With US headquarters in Huntington Beach, CA, the company operates an appliance park in New Bern, North Carolina comprised of state-of-the-art factories for washers, dryers, dishwashers, ranges, ovens and cooktops. Used in combination with the Energy Savings Calculator, the Rebate Finder option delivers an even more substantial payoff for buying eco-friendly Bosch appliances. Offering valuable savings for consumers and trade visitors, the simple click of the Rebate Finder button links the user to ENERGY STAR partners' special offers and rebates on energy efficient products, including little known options from local utility companies. "We know that gathering information on the latest environmental programs and products can be overwhelming, which is why Bosch developed the Green Resource Center By making it easy for people to the see the amount of money and resources they will save with our appliances, homeowners and builders will be able to quantify the value of choosing Bosch whether they are installing them in a single home or a whole development."